To say what letters contain is impossible. Did you ever touch your tongue to a metal surface in winter — how it felt not to get a letter is easier to say . . . In a letter both reader and writer discover an ideal image of themselves, short blinding passages are all it takes. Is there anything better than a letter – for both writer and reader? I've always loved correspondence, the handwritten kind that takes time to unfurl. I wrote my first letter to my grandparents who lived three states -- and a world -- away. I was 6, and I would dictate to my mother what I wanted to say. I would then copy her version onto my own paper, in my own hand. My grandma always responded right away (and my grandpa, too, with his own short postscript), and even included primitive, playful drawings of the Washington farm where they raised my father. As I got older, penpals joined my address book. They were bookish, earnest girls like me, who lived in places I'd never been: Wisconsin and Texas and other exotic locales. No deep friendships formed, but I was happy to write cheery letters on specially purchased stationery. I was even happier to receive a letter in return. Do you live by the ocean? Do you have a brother? I have a dog we call George, but her real name is Georgina. Later, letter opportunities increased: my best friend moved out-of-state, a boyfriend went to college, I moved across the country. I was jubiliant with the possibilites, but aware that my fondness for letters carried the melancholy themes of loss and change. After all, correspondence is created in absence. With each departure, there is sadness at the parting but happiness in the possibility that deeper selves might emerge across messy pages of real feeling. But it's too much to ask, really. Letter writers are rare. 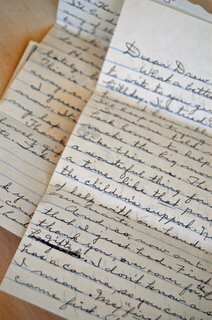 For over 30 years, my grandma and I regularly exchanged letters, until she died two years ago at the age of 95. My post office box is empty now but my email box is full. Though I'm grateful for any form of genuine connection, it's just not the same. I miss letters, the way they slow time to invite thoughtful reflection for both writer and reader. I'm looking for gentle gestures these days, the curve of letters, the slope of a signature, the cross-out in mid-thought. Letters are tender reminders that feeling is first, just as e.e cummings says. One must pause, read, and then read beyond. In a letter, writer and reader share a special language. In each envelope, we seal a message unsaid: I look for you in the pages, and see my own reflection, too.